Is your lawn infested with ants? This is a common problem in South Wales, and we are frequently asked to remove ants from our customers’ gardens. Ants can cause a variety of problems in your outdoor space, but most notable are the mounds of soil that the colonies produce. These can create raised spots on the lawn, which then get ‘scalped’ during mowing – that is, most of the grass plant is removed, creating bare areas for weeds or moss to colonise. If you need help removing the ants from your lawn, please call Lawn & Weed Expert on 0800 111 4958. 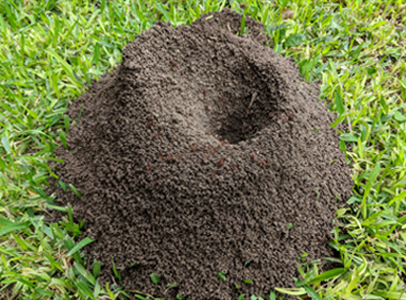 The ants’ mounds of fine earth should be allowed to dry out, then brushed vigorously with a heavy-bristled brush to sweep the soil particles evenly across the lawn. Next, a trowel should be used to dig into the nest. Apply ant powder deep into the nest, then replace the soil/grass. This approach is more effective than spreading the ant powder on the surface of the lawn (which risks scorching the grass). We provide professional ant control for lawns and gardens throughout South Wales. If your lawn is infested with ants, please contact us today and we’ll be happy to help.